On our managed servers you can view the versions of the additional PHP version directly in ISPConfig. If a new version is available, you can update the PHP version or use the “Auto-Update” function. With Auto-Update” enabled, the PHP version will be updated as soon as a newer version is released. Additional PHP versions can be installed in addition to the PHP version of the operating system and then used for individual web pages. PHP versions 5.6, 7.0, 7.1, 7.2 and 7.3 are available on our managed servers. The ionCube loader is always installed with all versions. Which versions are additionally installed always depends on the operating system of the respective server. For Debian Jessie PHP 5.6 is not an additional version, while for Ubuntu 18 PHP 7.2 is not an additional version. Which versions you see on your server for updates depends on the respective server – the screenshots may look different for you. You can see at a glance which versions are not updated or whether an installation is currently being updated. If an update is available, you will be shown the button “Update” and can immediately start the update. You also have the option to automatically update a version. All you have to do is check the box “Auto-Update” and save the settings. On our managed mail servers and full-managed servers you can not only set greylistening for each mailbox to on and off for the spam check, but also for RBL, SPF and spoofing. SPF and RBL are automatically activated for new mailboxes, greylistening and spoofing are disabled by default. What do these spam checks do in detail? The owner of a domain can specify which servers are allowed to send mails. If delivery via another server is attempted, the mail can be rejected directly. This happens in particular with spam mails if the sender in a mail is forged. Unfortunately, there are also postmasters who define these specifications incorrectly or simply forget to add a new server. It can also lead to problems with the SPF check if mails are sent via an external mail gateway beforehand. Our mail servers check incoming mail across one or more lists of servers that have recently sent spam. Connections from “spam spinners” are rejected directly. At the first connection the sending mail server gets a message that it should try again in a few minutes. This can reduce spam, but is not always optimal for mailboxes that are used for direct communication with customers. Otherwise it can happen that the customer sends a mail and then you have to explain that the reception can take up to 5 minutes. If a mail server has passed the other checks on the second attempt, its IP is on a whitelist and mails sent later arrive without greylistening. Email spoofing refers to the forgery of the email header so that the message gives the impression that it has a different origin or source. Spam distributors often use spoofing to get the recipients of the email to open the message so that they respond to its content. Log on to your server in ISPConfig and select the mailbox for which you want to customize the SPF, spoofing, or RBL check. In order to get ISPConfig GDPR compatible, we think that the default log file storage time for websites should be decreased and the statistics should be turned off. ISPConfig itself has no problems with the GDPR, because you can delete customers at any time and all data stored with this customer will be removed from your server. With the next ISPConfig release 3.1.12 the storage time of 10 days will be standard for new websites. However, a change for existing websites does not make sense, as the software is also used outside of the EU. The programs for creating web server statistics AWStats and Webalizer, which can be used with ISPConfig, also output the complete IP addresses of website visitors, if no corresponding adjustments have been made to the code. We consider this to be incompatible with the GDPR and have therefore deactivated the statistics on all our web servers (own and full-managed). To avoid doing this manually for each page, you will find a small bash code at the end, which you can simply run as root on your server. If you don’t have a –defaults-file, you can use -p instead and then enter your root password for MySQL. Of course you can also enter the commands in PHPMyAdmin. Don’t forget to make the changes on all servers if you have a multi-server setup. mysql --defaults-file=/etc/mysql/debian.cnf --database=dbispconfig -e "
With our plugin ISPConfig Automail you can automatically configure email clients like Thunderbird or Outlook. If you use one or more mail servers for the domains makes no difference. 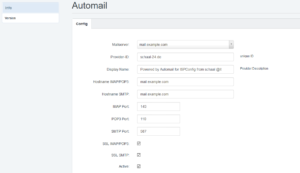 Just define the appropriate data such as host name and port for each mail server. everything else is done through a small web page that provides an Autoconfig service (Thunderbird) or Autodiscover service (Outlook). Autoconfig and Autodiscover request XML files via different addresses, to configure the email client according to your specifications. To use the ISPConfig Automail, you only need a current version of ISPConfig and a website (Apache or nginx). In this example example.com is your domain, over which the automatic setup of the mail clients will run. You are free to choose this domain. The domain client.com is the domain that queries example.com for the setup. 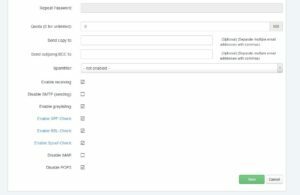 Log in to ISPConfig as admin, go to System / CP User and activate the module automail for the user admin. After you have logged off and on again, the module is available for you. Create a remote user who can use the “automail functions”. If you have a multi-server setup, you may need to allow remote access. Under Provider-ID you enter a unique ID that identifies your setup. You can use the domain name of your server. The two Hostnames are the names by which mails are retrieved (IMAP/POP3) and sent (SMTP). If you run everything on the same server, you must enter the same name in both fields. For Ports, enter the ports that should be used for your mail server. You need an A-record for autoconfig.example.com and autodiscover.example.com pointing to your web server. If you use IPv6, you should also create AAAA records. _autodiscover._tcp.client.com. SRV 0 0 443 autodiscover.example.com. With alias or server_name this domain can be used later by any customer or email domain. Create the alias domain autodiscover.example.com and point it to autoconfig.example.com. You don’t need any redirects, the important thing is that the domain has an SSL certificate. A-Records in DNS are enough to point to your web server so you can use Let’s Encrypt. Upload the files from the website directory from the archive to the newly created website and adjust the data in config.php. Rename the htaccess to .htaccess. If you use nginx, you can also delete the file directly. In the file test you will find the result. The email address must exist of course. For Autodiscover there is the Microsoft Remote Connectivity Analyzer. Various scanners can be used to scan incoming and outgoing mail. For example, ISPConfig uses SpamAssassin, ClamAV and Amavis. The individual threshold values (more on this later) can be defined individually. To prevent spammers from appearing in the inbox, you can automatically move mails to a separate folder based on an individual spam value. This makes spam mails visible via an IMAP client or a webmailer and reduces the risk of not seeing a mail mistakenly identified as spam. Caution: when the mails are picked up using POP3, the moved mails will not be retrieved. They are no longer in the inbox, but in a subfolder. This moving is always done directly on the server. The first line shows which scanner was used. If you want other information, you can adjust the Amavis-Config accordingly. For Debian or Ubuntu, this would be $ X_HEADER_LINE in /etc/amavis/conf.d/20-debian_defaults. If this is set to YES, the mail was classified as spam. The X-Spam score is the value that SpamAssassin has determined based on its filter rules for the mail. In ISPConfig, you can define the value from which a mail should be marked as spam (5.00 for Trigger happy) under Policy – Spamfilter policy – Tag Level in the “SPAM tag2 level” field. This is the integer value of X-Spam-Score in * – in our case, the score is 7.039 and thus there are seven asterisks. You can use the value with your own filter, if you do not want to take the X-Spam-Score. Yes, score=7.039 this is the same as in X-Spam’s flag and X-Spam score. tagged_above=3 specifies the value from which these lines listed here should be inserted into the header. For ISPConfig, this is the “SPAM tag level” for the Spamfilter policy. BAYES_50, DATE_IN_PAST_24_48 and SCHAALIT_HEADER_964 have increased the value, the signing with DKIM has reduced the score by a total of 0.1 (DKIM_SIGNED, DKIM_VALID, DKIM_VALID_AU) and RP_MATCHES_RCVD has decreased the value by 0.001. The rule applies to the from line in the mail. In doing so, a RegEx is used, which spans various spam mails on the subject of german private health insurance. After Postfix has returned the mail from Amavis (see Scan Procedure), the mail is either sent, or – if the recipient is one of our users – delivered via Dovecot into the mailbox. The local delivery of the mail by Dovecot is one of the decisive points: if the mail was previously marked as spam by SpamAssassin, it is not moved to the inbox, but to the subfolder Junk. For ISPConfig, the checkbox for the email account in the email filters must be set to “Move Spam Emails to Junk directory”. 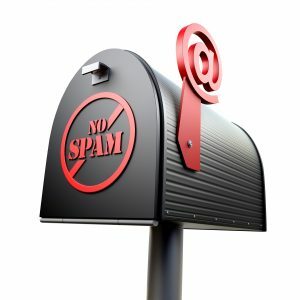 A spam filter must be selected for the domain or mailbox. If a filter is defined for the domain and the mailbox, the settings from the mailbox are in place. If only the domain has a filter, it’s also used for the mailbox. In short: Mailbox overwrites domain – this is the only way, to define individual policies for each mailbox. If you use an alias, the policy for the domain applies. The selected spam filter must be defined in such a way that the corresponding values also “fit” to the mail. If our filter had a “SPAM tag2 level” of 10, the mail would not be marked as spam. Spam-mails will only be moved if “Move Spam Emails to Junk directory” is set. Only the administrator can change or create policies. If every user had the possibility, this would affect all the mailboxes that use this filter. If you are in doubt, you better suggest an additional guideline. We regularly publish new rules for the spamfilter SpamAssassin of the Apache Software Foundation Apache Software Foundation. Of course, you can also use the rules for the ISPConfig spam filter settings. Most of our rules have a score of 5. Our rules can be used free of charge. For this, only our channel has to be added to the SpamAssassin-Config or our script has to be installed. Please do not forget to restart SpamAssassin after installing or updating rules. SpamAssassin uses DNS checks to detect new rules so that the script can be called every hour or at least dayly without generating a significant load.